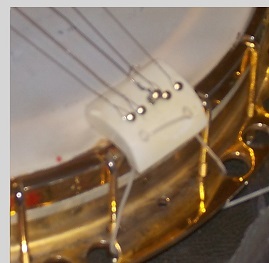 LOST BanjoMary 74's GOLD PLATED tailpiece while transplanting her BURLEY plectrum neck to the PURPLE BARNEY body. 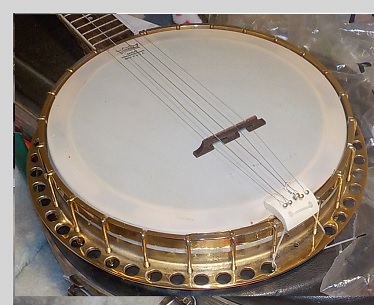 And she wants Banrney's old neck on the BURLEY body. So, I made one out of beef bone and brass tacks, tied on with synthetic gut, until such time as the original floats to the surface. A master cobbler at work, looks nice, and strong.